For the third year in a row and beating last year's mileage by 77 mpg, the student team from Universite Laval in Quebec, Canada took home the Internal Combustion First Prize with an astonishing best run of 2,564.8 miles per gallon in the Prototype class. And in the UrbanConcept class, the team from Louisiana Technical University in Ruston, La. took First Prize by achieving a best run of 646.7 mpg. "Every year, the competition at Shell Eco-marathon Americas gets a little tougher," said Anthony Bernier of Universite Laval. "With more teams participating this year, there are a lot of really smart and innovative fuel-efficient ideas to be seen on and off the track. We put a lot of time and hard work into our vehicle this year and are very proud of how we did. 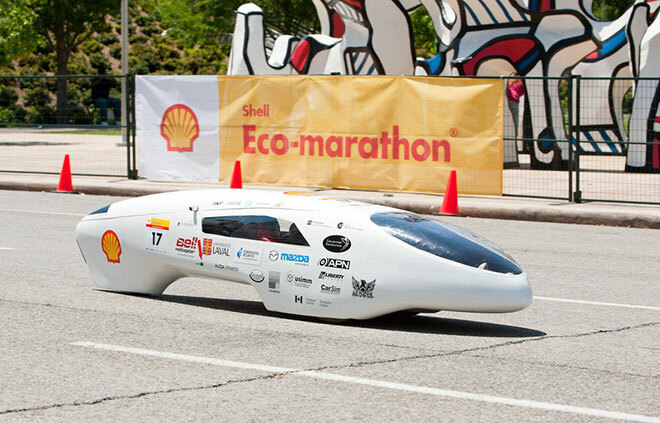 We are excited to be Shell Eco-marathon Americas champions for the third year in a row and to have beat our mileage achieved last year!" Bruce Culpepper, Shell Oil Company Executive Vice President Americas Operations, kicked off the challenge on Saturday, April 16, by waving the green start flag and asking the teams to "Start your fuel-efficient engines!" The competition was steep with a record number of 62 student teams and their 68 vehicles competing.